10.0 – the king of ridability! Top show jumping capital with international background and in a class of his own for style and aptitude. Action Blue presents himself with balance and conviction at the jump, showing plenty of scope and great leg technique and bascule. He demonstrated his capacities impressively at his 30-day-test in 2015 and 50-day-test in 2017 in Schlieckau: His jumping qualities were given scores of 9.0 and 9.5, and even 10.0 for ridability. With the final mark of 9.01, he finished fourth of his group, while his stable buddy and half-brother on the paternal side, Actender (2nd reserve champion of the OS licensing in Vechta 2014) won with 9.16. Since then, he has been victorious with highest marks in L level show-jumping classes. His oldest offspring appeal with their athletic conformation and have won numerous awards. A pedigree full of performance genes: His sire Action Breaker is, at present, ranked as one of the best show jumping stallions worldwide. He was ridden successfully by Sergio Alvarez Moya (ESP) at the World Equestrian Games in Kentucky in 2010 and in the Grand Prix of Aachen he finished third. 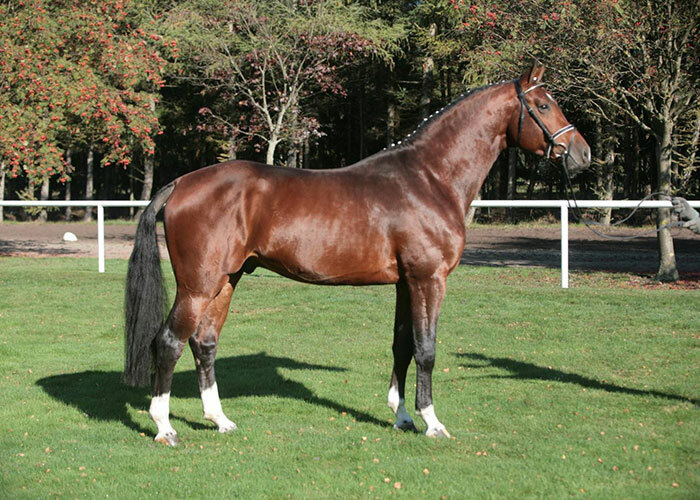 His dam-sire Chacco-Blue won international Grand-Prix classes, including the Grand-Prix of Neumünster in 2012 and was third in the Grand-Prix in Aachen. 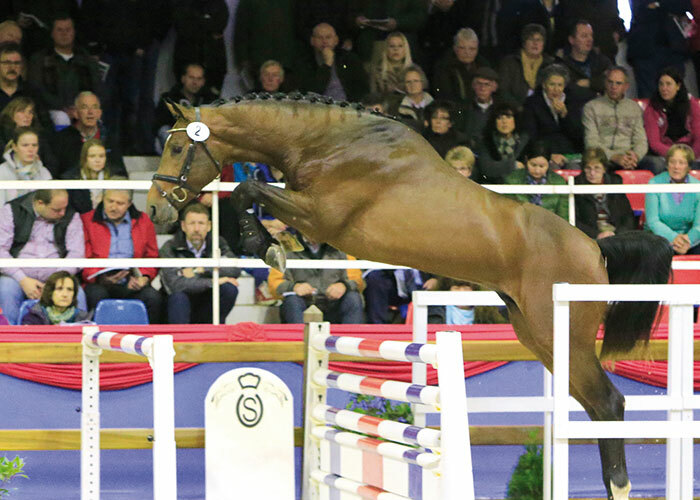 Chacco-Blue has sired, so far, 39 licensed sons and 270 successful S level show jumpers, who have so far won more than 3.1 million euros and placed their father first of the 2017 WBFSH world ranking. 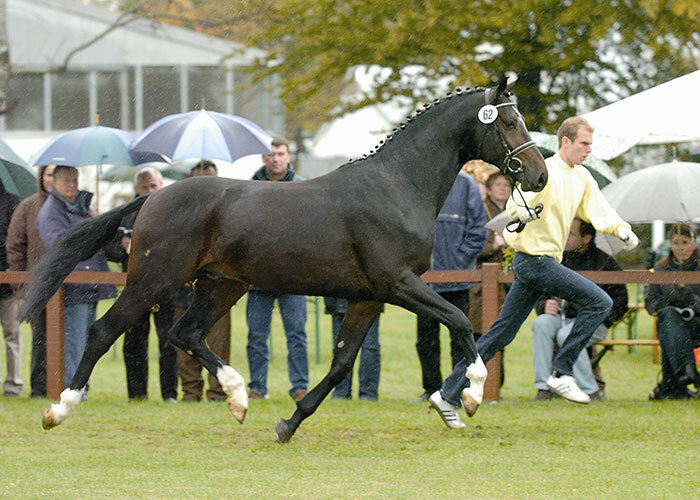 The established son of Landadel, Landor S in the third generation, was the German champion of six-year-old show jumpers in 1997 and was successful at S level. 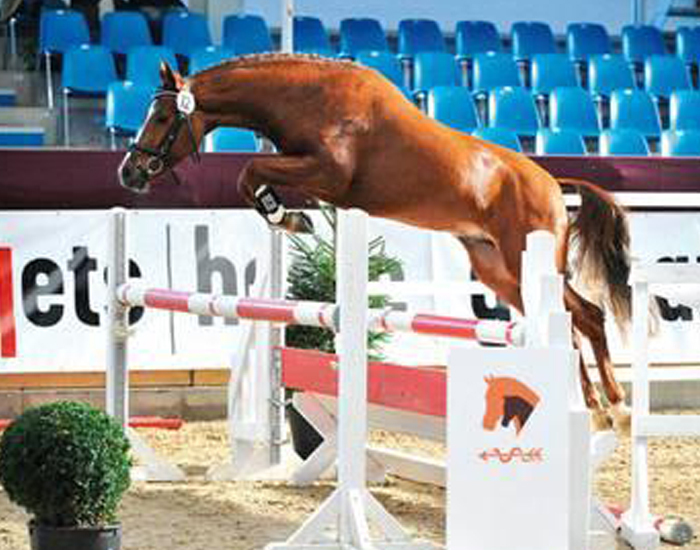 Grandeur, three times winner of the show jumping Derby and in his time the most successful show jumping stallion worldwide; Pilot, the Westphalian legendary sire and Rasso, the Bavarian show-jumping line founder, round off this famous pedigree. The multi-branched Hanoverian dam-line 620/Jasminblatt (by Jassy I-Halt-Notatus-Colorist etc.) produced many licensed sons, among them Caroly (German champion), the internationally successful show jumpers Garlic/Heinrich-Wilhelm Johannsmann, Prestige/Franke Sloothaak and Stella 153/Meredith Michaels-Beerbaum and the successful dressage horse Blind Date 25/Victoria Max-Theurer (AUT). HLP 2015 (30 day test) ZW Dressage 64 Jumping 130.